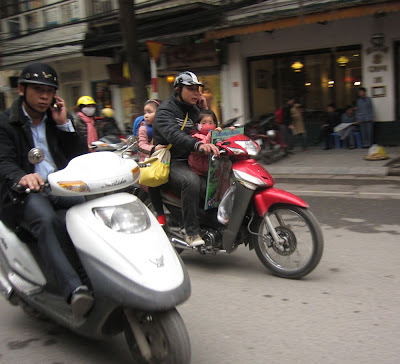 The Sergeant was fascinated with Vietnam's scooter culture. He took many pictures of two-wheeled vehicles old and new hauling a variety of goods. But what amazed me was the lack of safety precautions. There appeared to be no limit on the number of passengers. Helmets seemed to be required only for adults. And most of the helmets were simply plastic ballcaps. Not of much use in an accident. Cellphone use while driving was also common. As was driving on the sidewalks or going the wrong way down one-way streets. We did see a few accidents, but in most cases no one was driving very quickly so the damage didn't seem too serious. I just worry about all those little kids and their precious noggins. 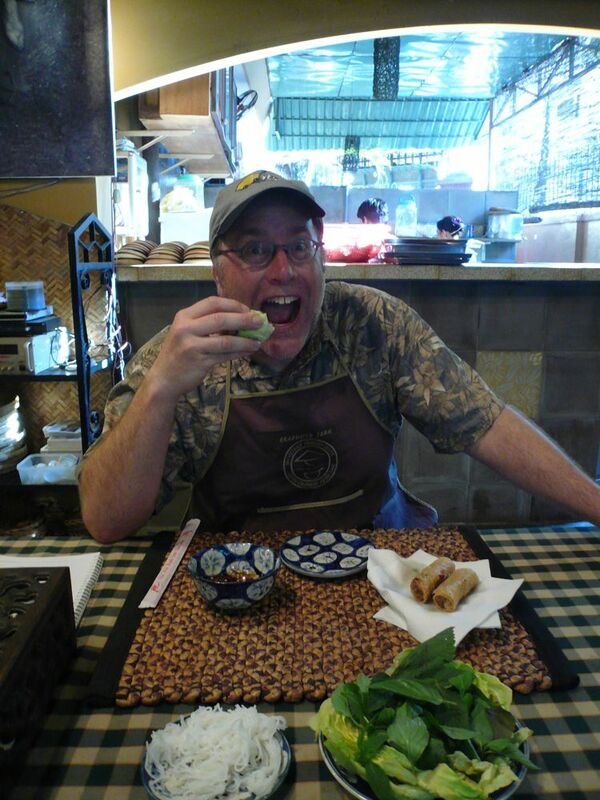 I first read about cà phê trứng on Eating Asia. Then Manisha reminded me about it. 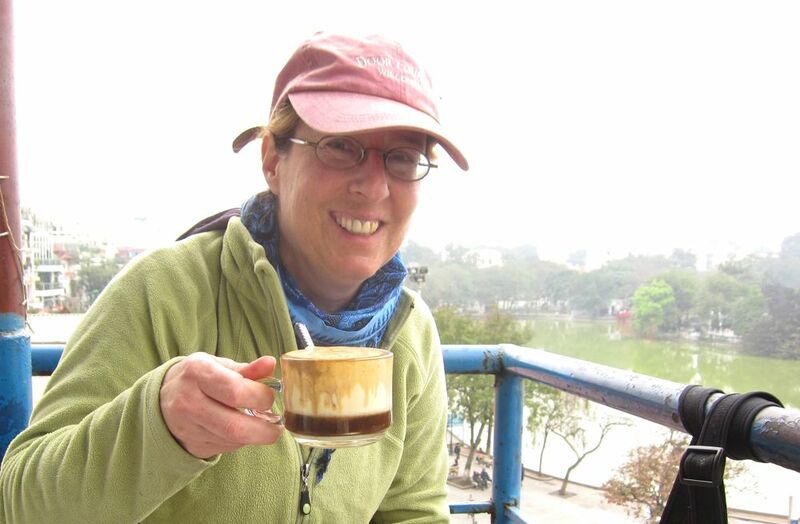 I love love love Vietnamese coffee, and I'm fond of eggnog, so something like a mix of the two sure sounded right up my alley. 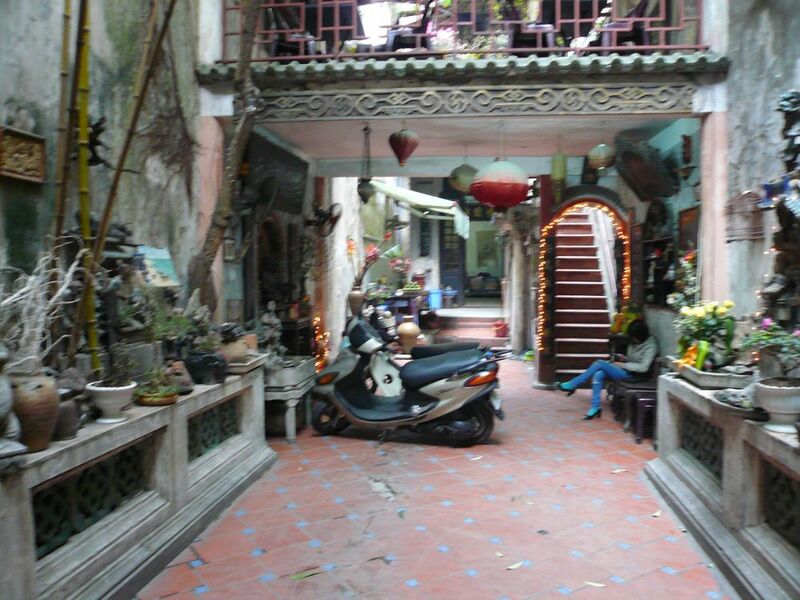 And right up an alley is where you'll find it in Hanoi. 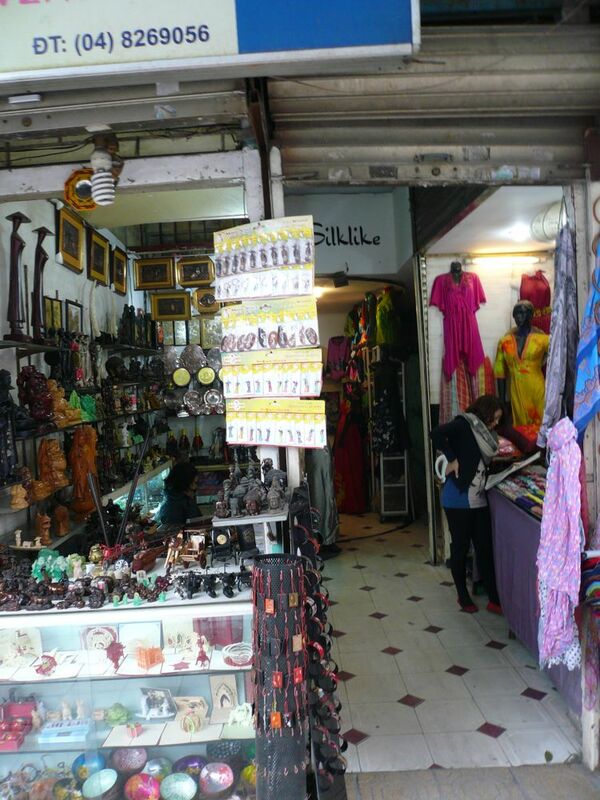 The Sergeant was a little concerned when I dragged him down this narrow passageway through a souvenir shop. 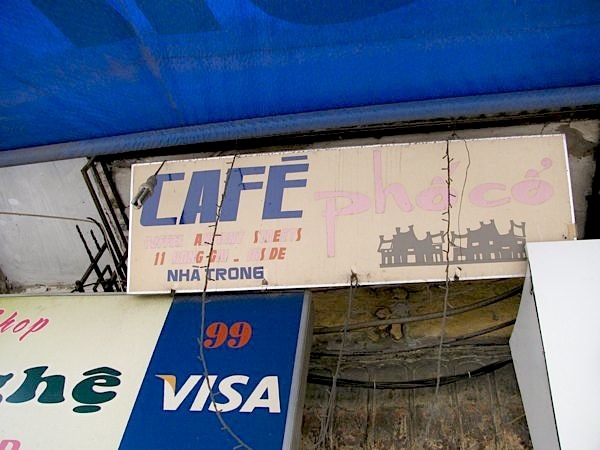 Cafe Pho Co's faded sign out front is not obvious  I didn't even spot it until we were leaving. 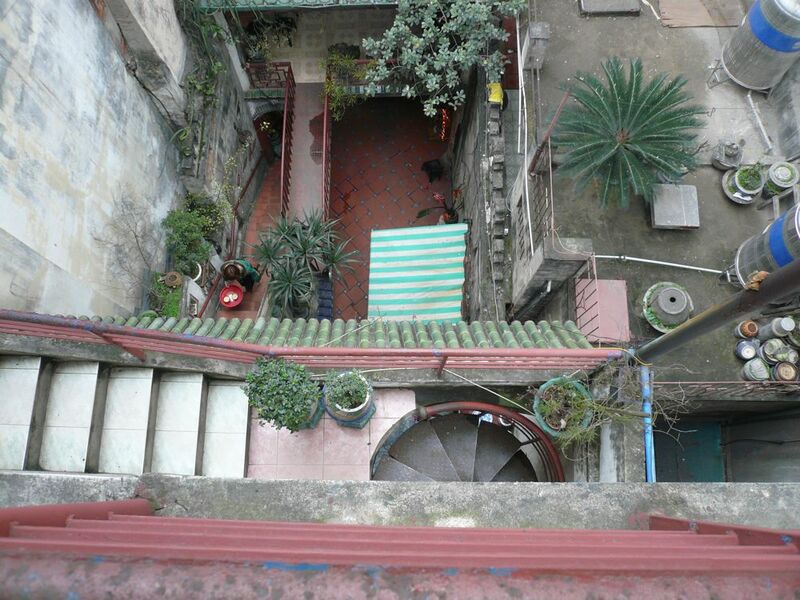 But the passage leads to a lovely, if dim, courtyard and an Escheresque series of stairways. 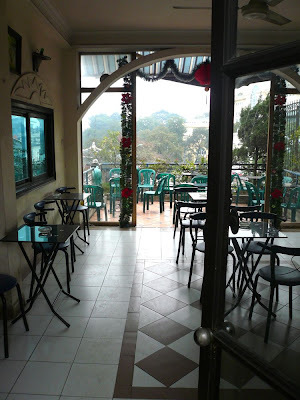 You place your drink order with the bored girl sitting at the foot of the stairs, then climb. Up a long flight of tiled stairs. Up a circular staircase. Up another narrow metal staircase. 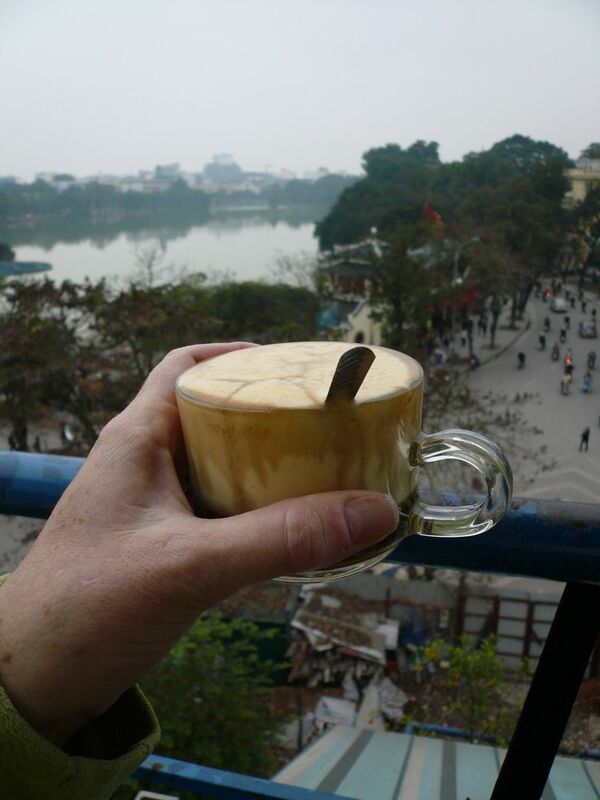 You're rewarded for your climb with a most awesome view of Hoan Kiem Lake, the lake of the sacred turtle. And if the day is misty and the hour early, you might even get a table by the railing, and reasonably speedy delivery of your tasty coffee. Yep, it is indeed quite yummy. It's made by frothing egg yolks and sugar, then adding strong, hot coffee. I could have had three more. There were other seating areas, including a second floor overlooking the lake, and an interior courtyard terrace. Can you imagine how much exercise the servers get when the place is full? Cafe Pho Co has a reputation for surly service (according to reviews I'd read and a couple Vietnamese people I spoke with about it), but we were there for the coffee and the view, both of which were lovely. You can try making ca phe trung yourself. I found a couple of recipes, one at Gourmet.com (if you have time, watch the video, too. Very interesting) and one at iloveallrecipes.com (which appears to be a rough English translation of the same recipe I found on several Vietnamese sites). 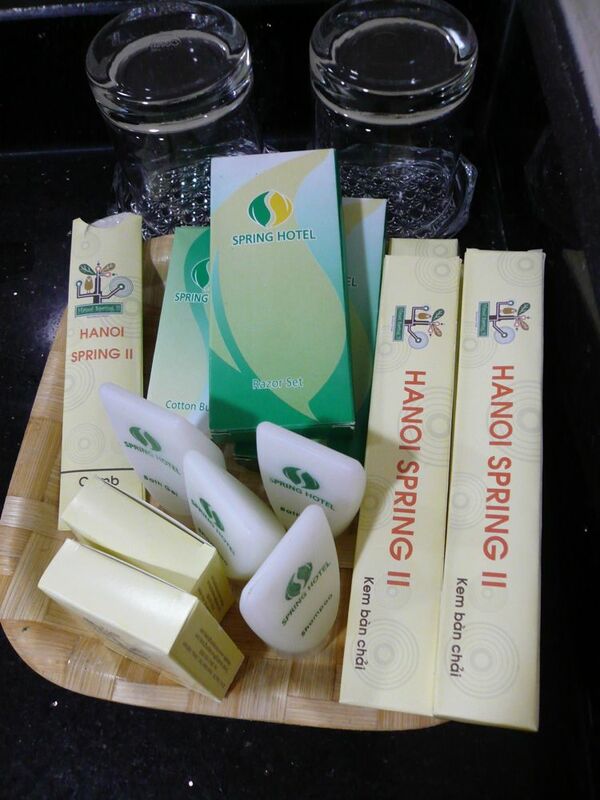 But for the best flavor, get yourself to Hanoi! 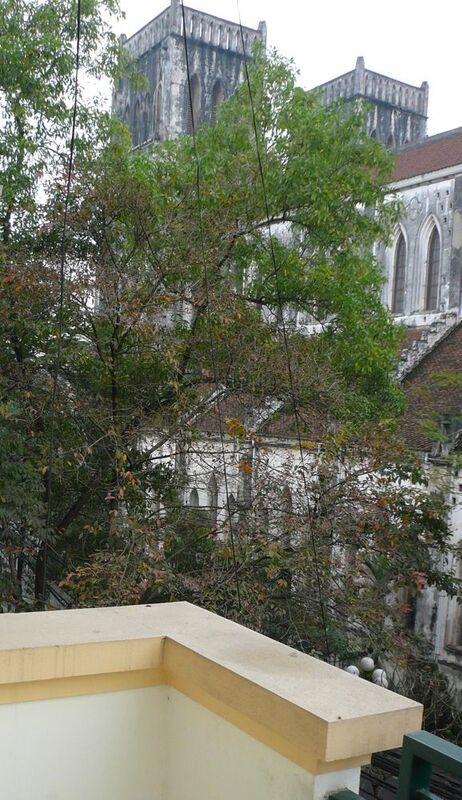 Here's a quick video of the chanting we heard at Hanoi's Saint Joseph Cathedral. I'm assuming it's the rosary. It was about 2 o'clock in the afternoon. 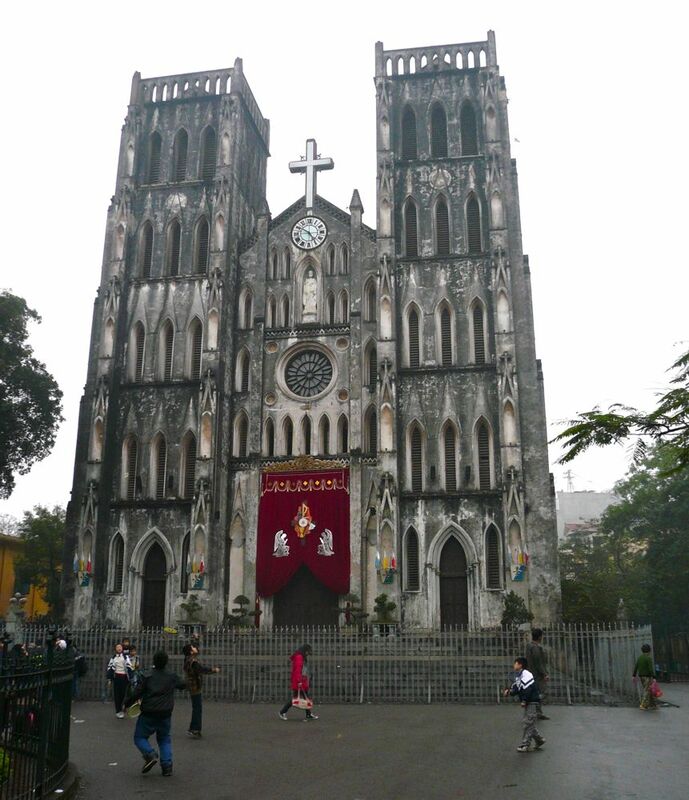 I found a page that has a little more info about the Hanoi archdiocese and Catholics in Hanoi here. There's an interesting "brief history" at the bottom of the page. 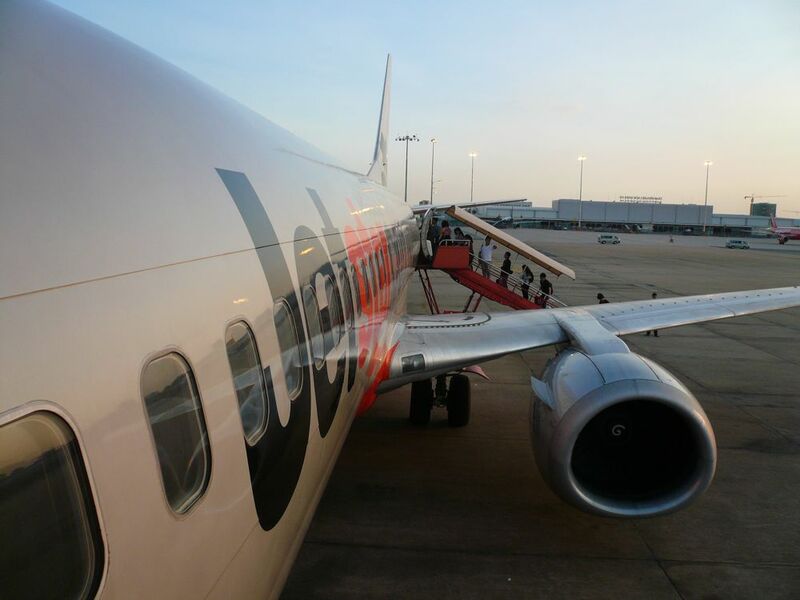 After four days in Saigon, we flew to Hanoi on JetStar, a budget airline that lives up to the designation. 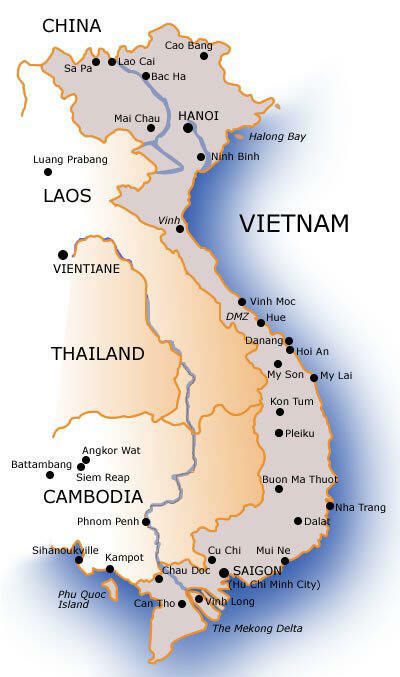 Our two-hour flight cost $60 each (versus $120 with Vietnam Airlines), but you have to be prepared for the flight to be delayed until they can get enough passengers for a full load. Still, it beats 31 hours on the train. Our pilot might've been ex-air force; he took evasive maneuvers around a thunderstorm that pulled more G's than you'd expect in a passenger plane and made us wonder if we'd end up as a U.S news item: "Two American tourists killed in Vietnam crash." 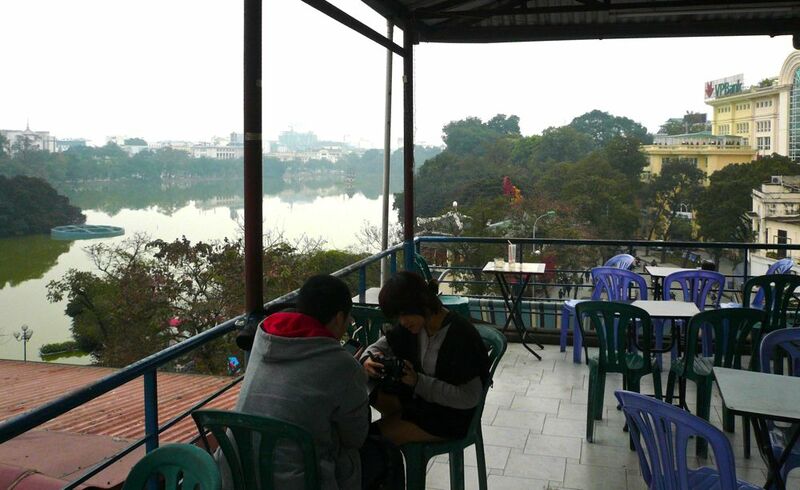 Nevertheless, we landed safely in Hanoi, where the weather was blessedly cool and misty. You could tell the Saigonites from the Hanoians immediately. The former immediately started shivering as if we'd arrived in a blizzard, the latter simply shrugged and pulled out their winter coats. It was about 60 degrees. 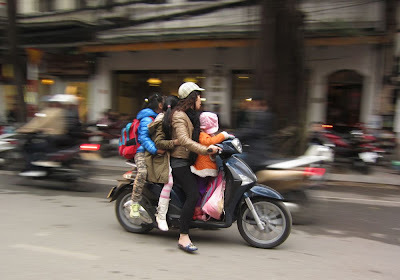 I'd arranged to have a driver from our hotel pick us up; the Hanoi airport is a good 45 minutes from the city and the cabbies are notorious for scamming travelers (this is true in Saigon, too). 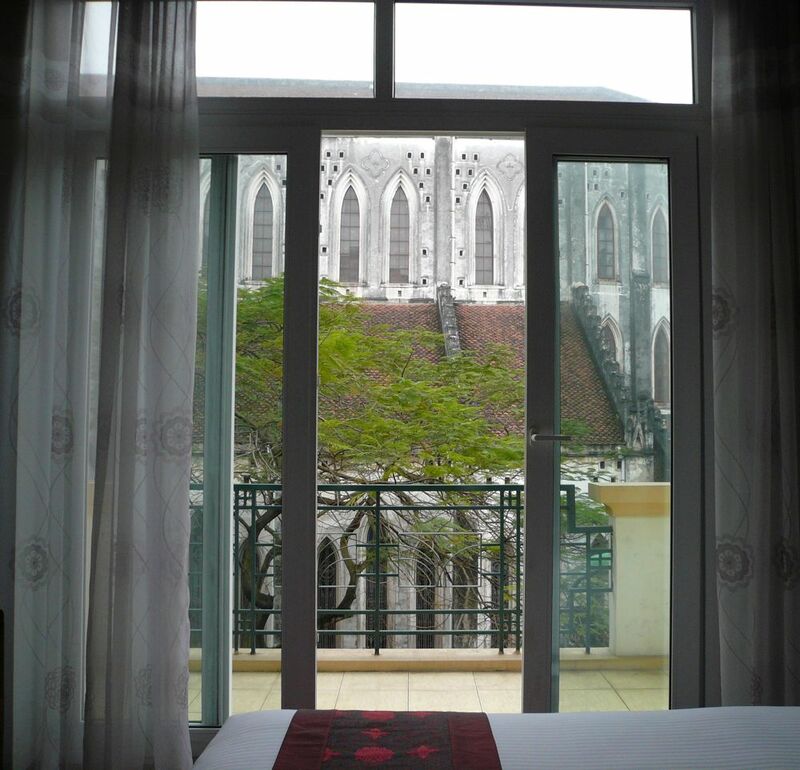 We booked a room at the Hanoi Spring II Hotel on the recommendation of a friend, who said it was conveniently located close to the cathedral in the Old Quarter. Little did we realize how close until we opened the drapes in our room! 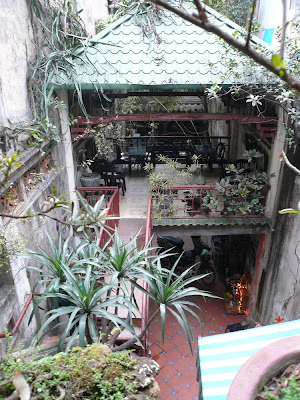 We were on the third floor, with a balcony that wrapped around around the corner of the building. Below was a one-way street that was not heavily trafficked, with shops, hotels and restaurants on one side, and the wall of the cathedral grounds on the other. 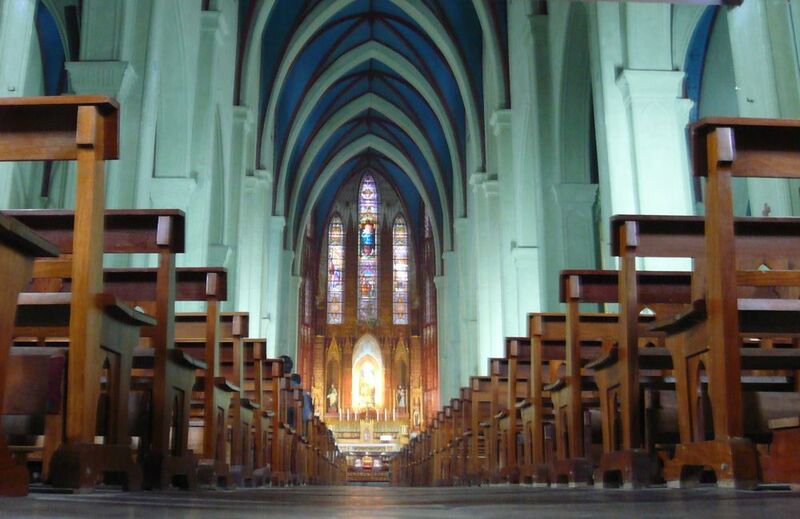 Built in 1886 by French colonists, Saint Joseph's Cathedral is the center of Catholic worship in the city. Mass is still held there daily, as evidenced by the loud ringing of the bells at 5 a.m. 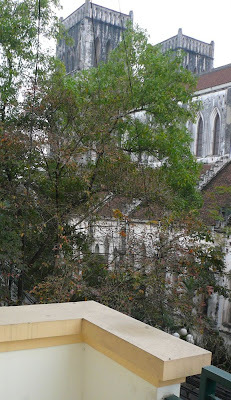 Still, that's much nicer than the incessant honking and early morning calisthenics programs outside our hotel in Saigon! 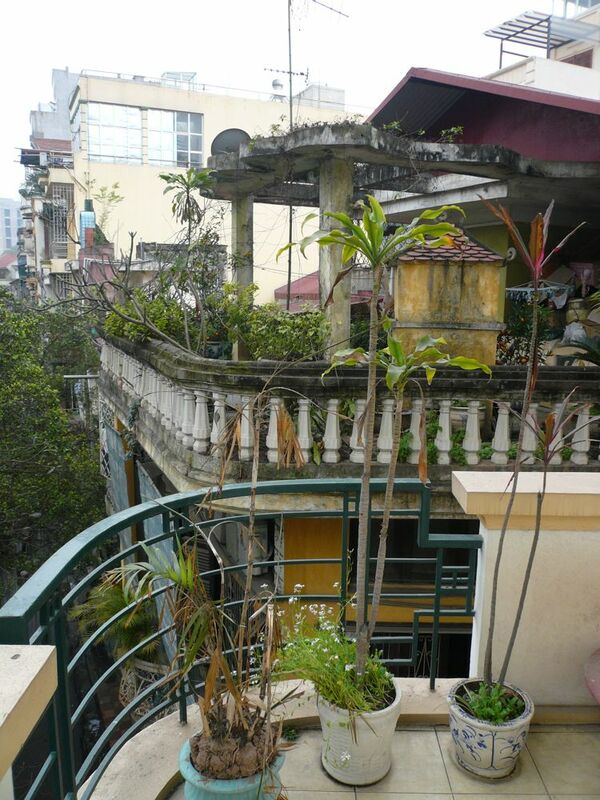 Looking the other way, we had a view of rooftops and balconies. Even in newer buildings, there are always elements of French architecture, and potted plants everywhere. The high humidity seems to make watering them all unnecessary. 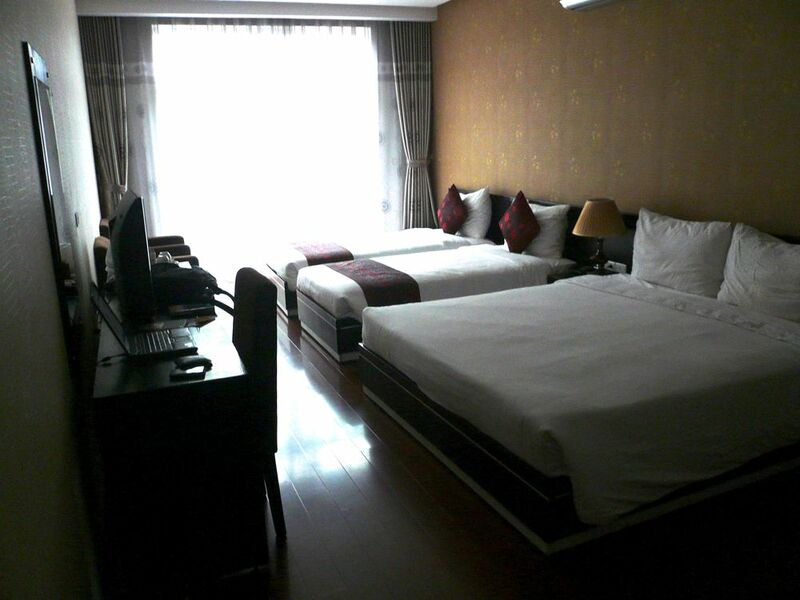 Our room was nice, too, albeit somewhat crowded with two extra beds. 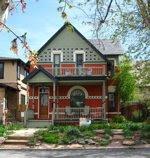 There was some talk when we arrived about having been upgraded due to a large group booking the upper floors. 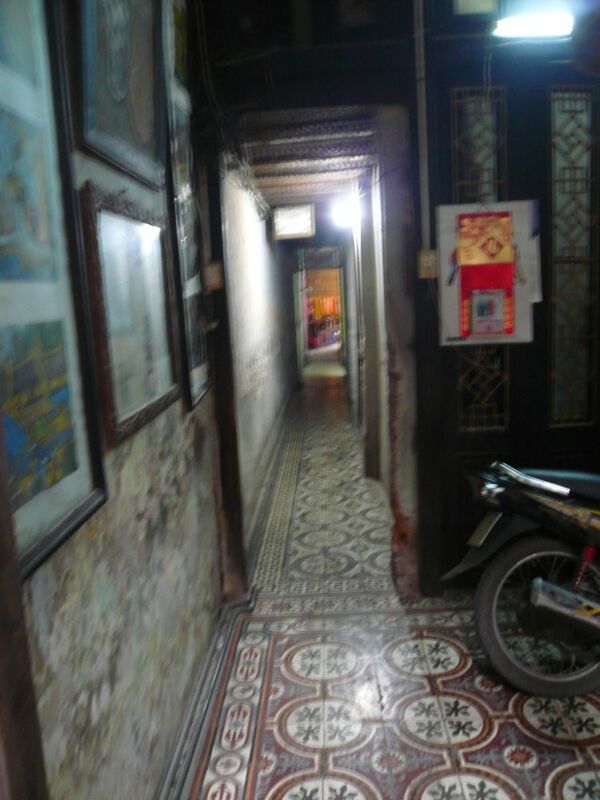 I never saw the other rooms, but certainly most of them did not have our view  each floor had only one room facing the front, the building was so narrow. 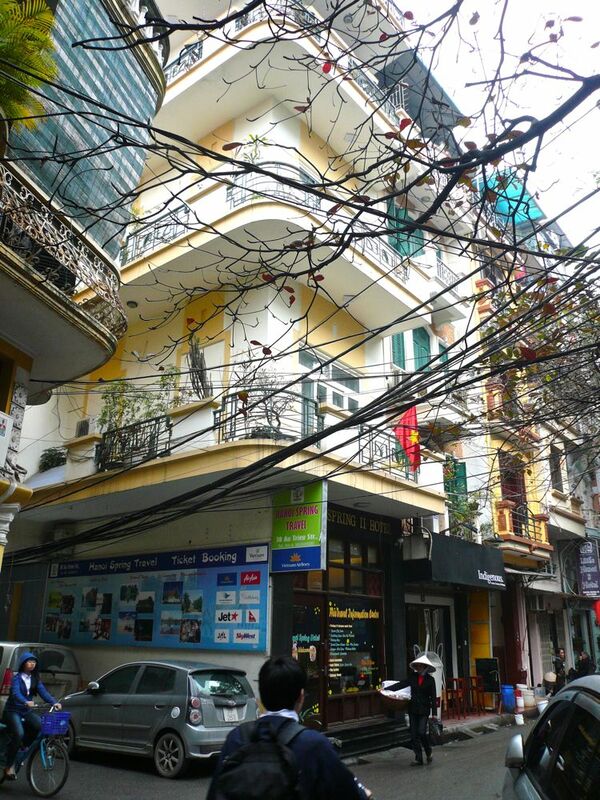 This seemed to be typical of many buildings in Vietnam, where property taxes are based on the amount of street frontage. The room also came very conveniently equipped with a laptop, which I used to research and book the latter part of our trip. The big bathroom had a walk-in shower and all the toiletries that seem standard in Vietnam's mid-range hotels: soap, shampoo, conditioner, ear swabs, shower cap, comb, toothbrush. 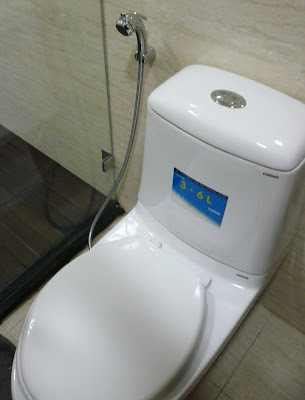 The toilet also featured something that's fairly common in Southeast Asia and elsewhere but not seen in the United States: a bidet sprayer, a.k.a. bum sprayer. You can use it for personal cleanup instead of toilet paper, and it's handy for cleaning the toilet. It's also marketed as a diaper sprayer, for rinsing cloth diapers. It connects directly to the toilet fill hose and has pretty good pressure. 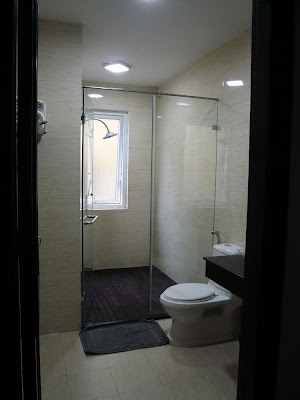 In places where toilet paper is expensive, not available, or has a tendency to clog ancient plumbing, the bidet sprayer is a clever and hygienic option. We saw them in most public restrooms and even on the train. But let's get back to a more lofty subject. The cathedral is an oasis of calm in the old quarter, and certainly a helpful landmark. The little plaza in front of it is off-limits to cars and scooters, so kids can play there. 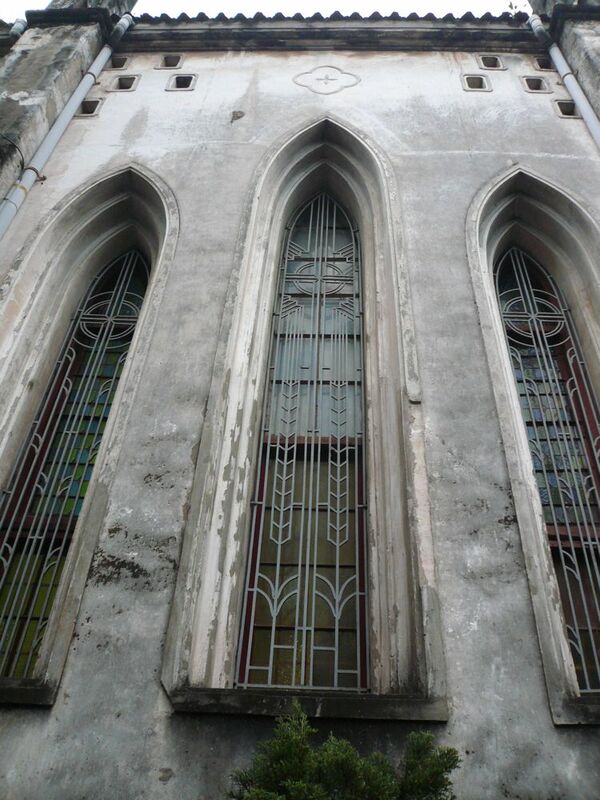 We walked around the outside and admired the elaborate Gothic architecture. Really great patina on the stone. The inside was pretty spectacular, too. There was a group of old parishioners  all women  near the front, chanting the rosary in Vietnamese. It sounded super-eerie. 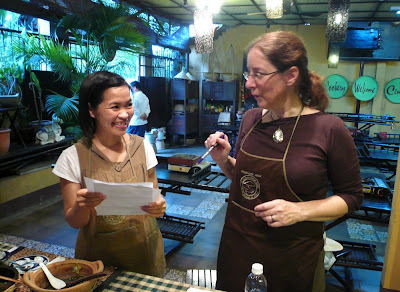 One of the things I really wanted to do in Vietnam was try some cooking classes. 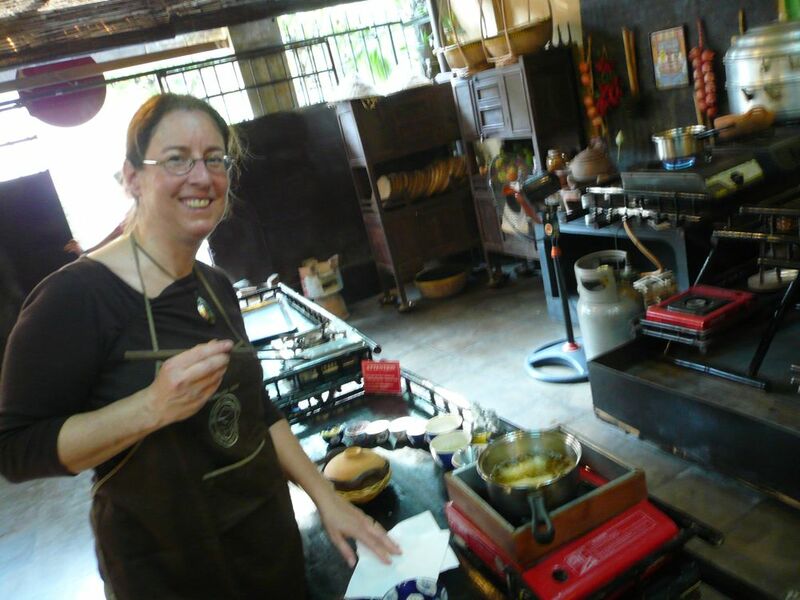 The Lonely Planet guidebook listed one cooking school in Saigon, the Vietnam Cookery Centre. We signed up for an afternoon class and were the only students. Chef Bao, at right, was nominally our instructor, while Miss Linh, below, was more active in engaging us with translations of his instructions and monitoring our progress. 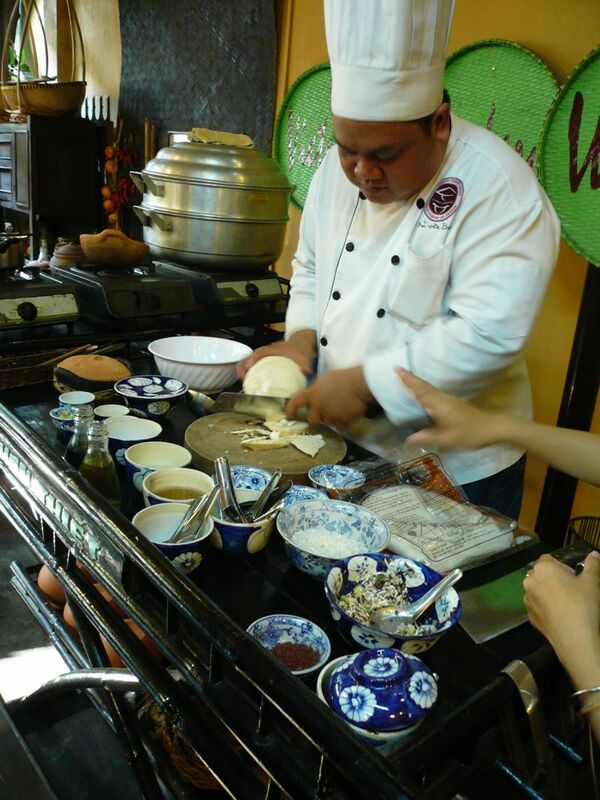 The menu included spring rolls with dipping sauce, sour clam soup, caramel pork in a clay pot, steamed coconut rice and steamed bananas in coconut milk. 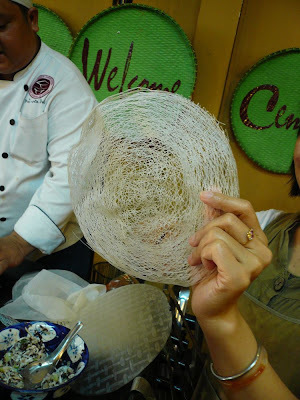 The fried spring rolls were wrapped in a kind of net rice paper I had never seen before, called banh trang re. It made for a much lighter roll. And so far I can't find it for sale in Denver or even online. That's a bummer. We each had our own work station, with most ingredients pre-chopped and/or pre-measured, so our cooking was mostly an assembly process. That seems to be a fairly standard cooking-school practice  it's an efficient way to demonstrate how a dish is put together without having to spend a lot of time mincing ingredients. 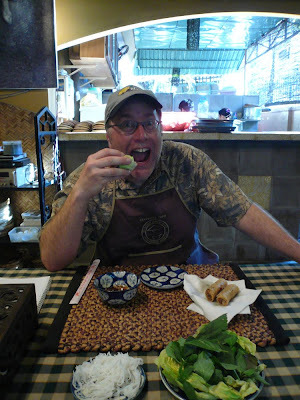 We got to pause halfway through to enjoy our spring rolls, which are typically eaten rolled up in a lettuce leaf along with some rice noodles and herbs, and dipped in fish sauce enhanced with lemon juice, sugar, garlic and chile. Then we cooked the rest of the dishes. 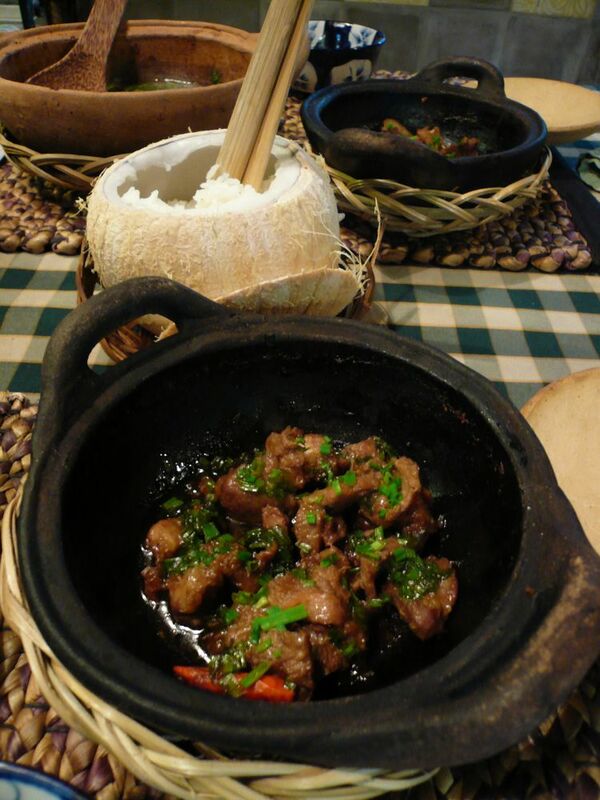 The caramel pork was very rich and tasty, and was greatly enhanced by the rice that was steamed inside the coconut. The sour clam soup was interesting but probably not something I would make again. The bananas in coconut milk were made for us, as dessert. Delicious! In all, our experience was positive, despite some communication glitches. We were charmed by the classroom and by the sincerity of our teachers. 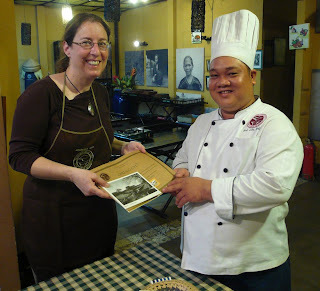 They gave us each a certificate of accomplishment, a book of the recipes we made and some very pretty postcards as souvenirs. 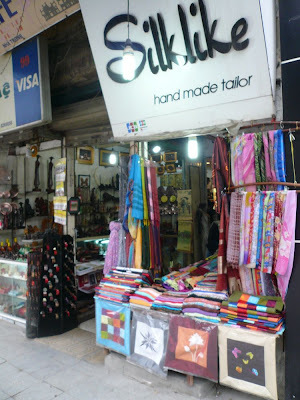 If you're planning a visit to Saigon, you should give them a try!